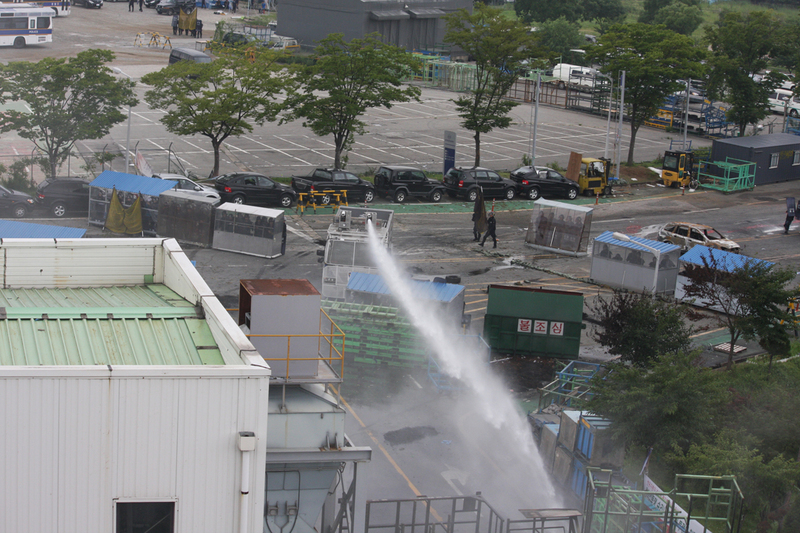 This report, from yesterday, is about the 3rd day of the police attack to evict the occupiers of the Ssangyong Motors factory at Pyeongtaek in South Korea. 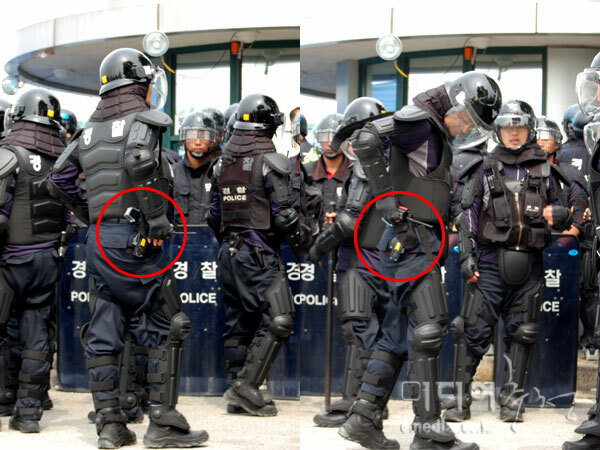 The cops and the strikebreaking gangsters ("kkang-pae") have resorted to using taser guns on individual strikers, in addition to using helicopters to spray a thinner-based teargas liquid directly onto the strikers on the roof of the occupied paint department. Cops used taser guns; one striker hit in the face; cops sprayed thinner-based liquid tear gas; doctors and nurses blocked at factory gates, taken to police station! 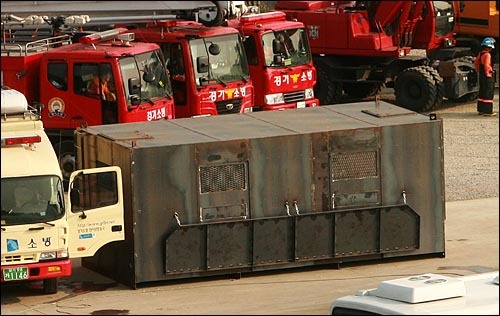 The police brought a metal container to be lifted by crane and lowered on the roof for an attack, which was also used in Yongsan [on January 20, 2009: see link to libcom story]. The cops and the company are planning this murderous plan. Do they want a 2nd Youngsan disaster? 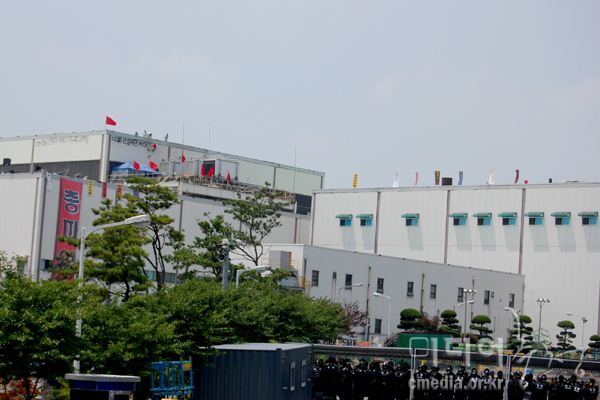 Today at the Pyeongtaek SSangyoung factory many horrible things happened. During the entire early morning [a.m. hours], they broadcast loud noises trying to wear down the strikers and provoke fights. 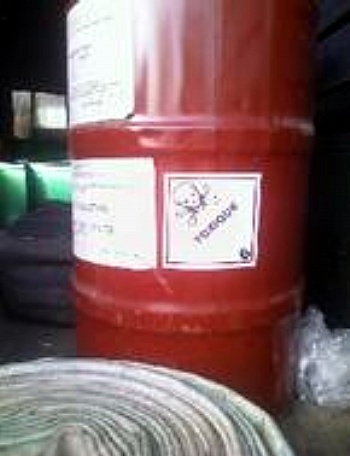 A cop helicopter, flying low, sprayed a toxic thinner-based teargas liquid which melted styrofoam immediately. To the strikers who were crying out for their jobs, they just responded with guns. Using a taser gun, one striker received a serious injury on his face; another two got on their legs. The comrades were only taken care of 3 hours later because the police and company had blocked the medical people. The company turned off the water hydrant system, so we can't wash the tear gas off, and if there is fire there would be no way to extinguish it. According to the medical people [from the Association of Physicians for Humanity], the strikers’ situation is really gruesome right now. For the comrade who got tasered in his face, the fishing hook-like electrode had to be removed without proper equipment. He insisted on staying with the strikers to continue fighting, staying in the factory and avoiding arrest, even though there’s a risk of infection. Furthermore, due to 3 days of continuous fighting, the number of injured occupiers has reached 50; those with high blood pressure and diabetes are in a very dangerous situation because medicine can't be brought in. Glaucoma patients don’t have medicine and are in danger situation of losing their eye sight. 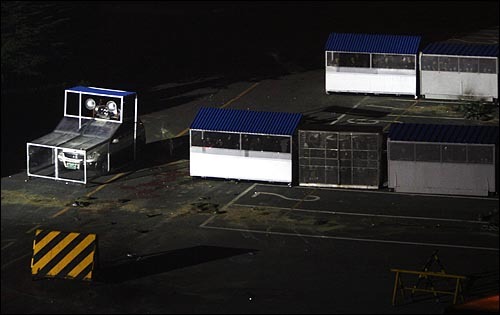 Lots of strikers were injured in the attacks of hired thugs, scabs, and riot police but have received no medical treatment; if their isolation lasts any longer, there's a chance that they'll be disabled for life. Lot of comrades, without antibiotics, have infections and sores with pus in their mouths. The medical people who visited the strikers spoke tearfully about strikers possibly suffering from septicemia, with life-threatening consequences, if they don't receive antibiotics. There are also the damaging psychological effects caused by the anxiety as riot cops get closer and closer to the factory. Also, the unavoidable teargas everywhere is causing strikers to have indigestion, sleeplessness, and chronic headaches. The occupied factory is full of suffering. Even in the time of war, if enemy combatants get injured, they ask the other side to stop the fighting for treatment of the wounded. But what kind of situation do we have here, in Pyeongtaek? 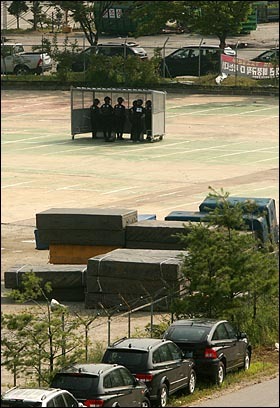 The merciless riot cops and company are risking hundreds of workers’ lives! Stop the blockade and at least allow proper medical treatment! Listen to the workers and engage in conversation! Even under this extremely difficult situation, our comrades are fighting heroically. Even under accumulating fatigue, without enough food, with dozens of battles every day, the workers are firm in maintaining the occupation of the paint department. On July 22nd, they pushed riot cops 100m further back from the paint department. People should come out for a strong demonstration of solidarity! Let's fight together in solidarity to show that the Ssangyoung struggle is a struggle for the jobs and lives of all working class people; the government is responsible for this situation. We don’t have enough time. Let’s organize to fight in solidarity in response to the heroic SSangyong struggle. This clip is from yesterday and is great! 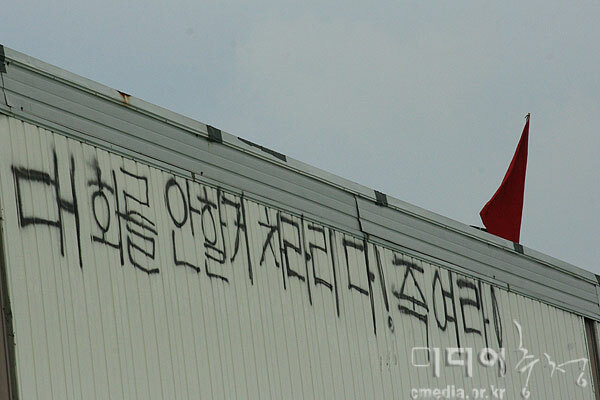 The occupiers came out of the paint department building and are fighting the riot pigs hand-to-hand near the main entrance of the factory. They are numerically outnumbered, but use molotov cocktails in an offensive charge. This is class war; these proles are my heroes. To see the video, click here. Perhaps actions at emabssies could be little bit helpful. Any chance to find the company ownership connections? They are most probably global.